Which Medicines Can Worsen Psoriasis? If you have psoriasis, you may need to know which medicines can worsen psoriasis and produce a flare. Psoriasis is a persistent, long-lasting (chronic) disease. There may be times when your psoriasis symptoms get better alternating with times your psoriasis worsens, known as flares. There are many different triggers for flares, and they vary from person to person. During the course of your life, you are likely to need medication for conditions unrelated to your psoriasis and see many different doctors and health care providers. You need to work with each doctor to see that you get appropriate medication for other conditions while avoiding the ones most likely to worsen your psoriasis. Beta Blockers: Inderal is known to worsen psoriasis for 25 to 30 percent of those with psoriasis who take it. It is a beta blocker medication are used to treat high blood pressure patients and those who've experienced a heart attack. Inderal can worsen psoriasis within several weeks of starting the drug. The other beta blocker drugs have the potential to do the same, so substituting one for another may not be a way to prevent this side effect. Lithium: Used to treat bipolar disorders, it can worsen psoriasis in 45 percent of psoriasis patients who take it, with more men affected than women. It can even trigger psoriasis in people previously undiagnosed, sometimes as long as 15 months after starting the drug. Antimalarials: Plaquenil, Quinacrine, chloroquine, and hydroxychloroquine are used to treat malaria and also may be used to treat lupus or rheumatoid arthritis. However, they may cause a flare of psoriasis in over 30 percent of people with psoriasis who take these drugs. Flares or a new case of psoriasis usually occur 2 to 3 weeks after starting treatment with these drugs. The one least likely to cause side effects for psoriasis is hydroxychloroquine. Angiotensin-Converting Enzyme (ACE) Inhibitors and Angiotensin Receptor Blockers: ACE inhibitors including captopril, enalapril, and ramipril have been reported to cause psoriasis eruptions, with skin side effects in as many as 58 percents of patients and occur 4 to 8 weeks after starting the drugs. These medications are given for high blood pressure. Interferons: These are used to treat hepatitis C and can aggravate existing or trigger new cases of psoriasis—and the condition may not improve after stopping the drug. Indomethacin (and Other NSAIDs): Arthritis may be treated with this is a nonsteroidal anti-inflammatory drug, but it has been known to worsen psoriasis for some people. 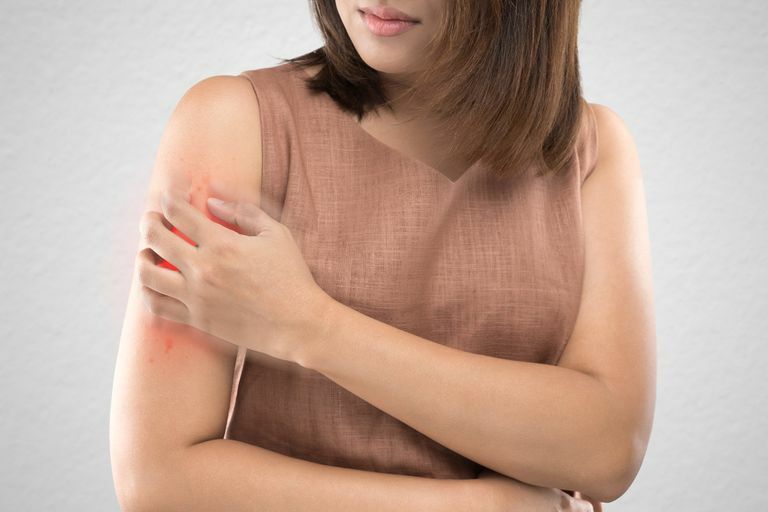 Because of this side effect, if you have psoriasis your doctor is likely to substitute other anti-inflammatory medication for arthritis and other conditions. However, some people have also reacted to the NSAIDs phenylbutazone, ibuprofen, and meclofenamate. Other drugs that may worsen psoriasis include the antifungal terbinafine, tetracycline antibiotics, anti-tumor necrosis factor medications, and gemfibrozil. If you have psoriasis, discuss it with each medical care provider who may be prescribing medication for you. That will enable them to consider while medications are least likely to cause a side effect. If you have any flare of psoriasis after starting a new medication, even if you started it weeks ago, report this to your doctor. You may need your medication to be adjusted. Causes and Triggers. National Psoriasis Foundation. Kim GK, Del Rosso JQ. Drug-Provoked Psoriasis: Is It Drug Induced or Drug Aggravated? : Understanding Pathophysiology and Clinical Relevance. The Journal of clinical and aesthetic dermatology. 2010;3(1):32-38. Hong J, Berstein D. A Review of Drugs That Induce or Exacerbate Psoriasis. Psoriasis Forum, Vol. 18, No. 1. Spring 2012.